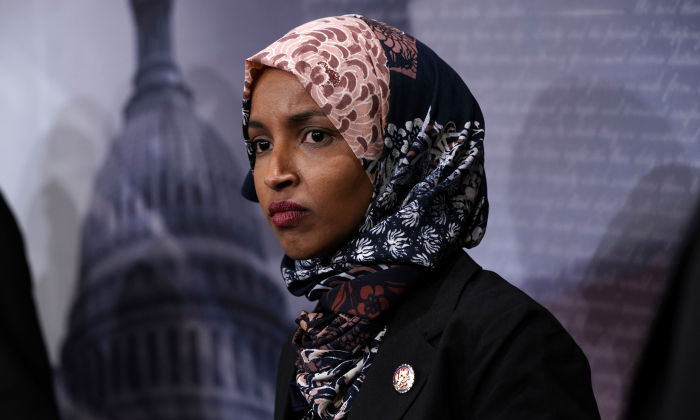 Rep. Ilhan Omar (D-Minn.), the first Muslim Congresswoman in American history, apologized again for perpetuating antisemitic tropes after receiving widespread condemnation for her latest theory about Jews. “Anti-semitism is real and I am grateful for Jewish allies and colleagues who are educating me on the painful history of anti-Semitic tropes,” Omar wrote on Feb. 11 in a post on Twitter. “This is why I unequivocally apologize,” she added. “It’s all about the Benjamins [money] baby,” she wrote. The trope in question is that a cabal of Jews secretly controls all manners of things, including governments and politicians, through secret funding. Batya Ungar-Sargon, the opinion editor of The Forward, a Jewish newspaper, was among those responding to Omar: “Would love to know who @IlhanMN thinks is paying American politicians to be pro-Israel, though I think I can guess,” she said. Omar gleefully answered, tweeting: “AIPAC!” referring to the American Israel Public Affairs Committee. The backlash built to the point that Democratic leaders went on record criticizing Omar, something they had thus far been reluctant to do since she, Tlaib, and fellow newcomer Rep. Alexandria Ocasio-Cortez (D-N.Y.) were sworn into office in January. “Rep. Omar’s use of an anti-Semitic stereotype was offensive and irresponsible. This kind of intolerance has no place in Congress—or anywhere in American society. No one should invoke anti-Semitic tropes during policy disagreements,” said Senate Minority Leader Chuck Schumer (D-N.Y.). In a joint statement, House Speaker Nancy Pelosi (D-Calif.) and other top Democrats condemned Omar’s comments. “We are and always will be strong supporters of Israel in Congress because we understand that our support is based on shared values and strategic interests,” the group stated. The group called on Omar to apologize, which she did about two hours after the statement was released.